Tuesday 25 January 2005 took me to visit Myriam Shivadikar in Finchley, North London. Myriam was responsible many years ago for encouraging me to go and study homeopathy so I have a lot to thank her for! She is a very dynamic lady and is always developing how she practises and prescribes. If you have ever attended an ARH conference she will be familiar to you as she is the very knowledgeable and rather glamorous presenter. I found hearing her story really fascinating as I started to understand how and why she practises the way she does. ROWENA: So tell me Myriam, who has influenced your practise of homeopathy? MYRIAM: Jan Scholten because what he says makes sense to me and like Rajan Sankaran, his talent is making remedies more practical, accessible and easy via a system. Robin Murphy did a lot for me in another sense. He says that homeopathy is incomplete and is merely a therapeutic system of medicine. This made sense to me as I came from a Traditional Chinese Medicine background, which has eight branches to it - acupuncture, herbs, diet, massage, remedial exercises, moxibustion and surgery. Homeopathy is just one modality and we have borrowed anatomy and physiology from allopathic medicine. As a result it seems isolated, and to think we can just give a remedy and that is enough is a mistake. People and the planet have changed and many homeopaths have realised that we can’t just give a remedy and wait for three months. Some colleges are therefore incorporating nutrition, diet, herbs and flower essences into their syllabi. Murphy has said that homeopathy is part of a yogic branch of healing but now in the West all we have left of this yogic branch is the homeopathic element. So his input into our profession, apart from his repertory, was to access all these old systems of medicines and bring them back. He works with astrology and homeopathy, for example, and his ideas are simple and can be found in his books. ROWENA: I found Murphy very inspiring on cancer. So tell me Myriam, how did your journey with homeopathy begin? MYRIAM: My father is a medical doctor and during the 1970s my mother was ill. All the way through our childhood she was ill, as she was an epileptic. She was on all the drugs, bedridden and there was nothing that anyone could do for her with conventional medicine. It was horrible for my father, being a doctor and not being able to help his own wife. Then one of his friends said that he was going to go to Liverpool to learn acupuncture for two years and asked my father whether he fancied keeping him company and my father agreed. After several months he started practising acupuncture on my mother and her epilepsy was cured – not palliated but cured! She came off all her drugs and my father was totally amazed. As a GP you can’t treat anyone in your NHS practice privately so he told patients who, for example, had neck and back problems that he had a new treatment for them. They would have to come off his NHS listing, enrol with someone else and then come and see him privately for acupuncture, but he would charge practically nothing, as it was practise for him more than anything else. So as kids we had all these weird people coming to the house. I always said I would never do this to my family, as we couldn’t even come downstairs because there were all these strangers in the hall. When it came to my A levels, I wanted to do take loads of subjects as I was very academic and a bit of a nerd. My father wanted me to do medicine but I didn’t. For him it was not up for discussion so I was forced to do the three sciences. After my A levels were finished I left home. I told my father that I loved him but that I really didn’t want to do medicine; it just looked too boring. In the early eighties, a Sri Lankan doctor called Professor Anton Jayasuriya started running some international congresses so that practitioners of every type of complementary medicines could unite. At that time homeopaths would scoff at acupuncturists and acupuncturists would say that homoeopathy was psycho-jargon. Practitioners didn’t understand each other’s disciplines and Jayasuriya saw a gap in the market. My father was the first British doctor to have a Bio-resonance machine. It was invented in Germany and he was asked to teach how to use it in seminars and conferences because he spoke English. So in time he went to one of Professor Jayasuriya’s conferences to teach about his machine and while chatting to him, my father mentioned me. Professor Jayasuriya suggested my father send me to Sri Lanka to learn acupuncture at the University. So a year after I had run away from medicine, I was on my way to study on a one-month intensive course where all you do is live, breathe, drink, eat and sleep acupuncture! At the time, I had absolutely no interest in going, but I did it to make him happy and I thought it would make him leave me alone to get on with my own life. But the unexpected happened. I went there, fell in love with medicine and stayed six and a half years in Colombo! Two weeks after I arrived, a war started. I was constitutionally Carcinosin at this stage and wrote letters to my mum saying that the war had nothing to do with me, that I hadn’t started it and that I was not responsible – a real Carcinosin delusion! And then I got very ill, which is how I got into homeopathy. I was absolutely eaten alive by mosquitoes and the doctors there had never seen anything like it. My legs got infected and there was pus everywhere. It was terrible and I couldn’t walk for two months. I was staying in the students hostel and there was a German homeopath there who was learning acupuncture. People came from all over the world just to learn acupuncture for one month. It was a taster; it did not qualify you to practise it, but you would get an idea as to whether you wanted to study further or not. ROWENA: Were they mostly medics? MYRIAM: A lot were but there were lay people as well. So, this German homeopath was observing me in agony in the hostel but I wouldn’t take the antibiotics because I never had had drugs in my life. I was flushing them down the toilet because of my principles. Everything hurt. Just negotiating to go to the toilet, which was a few yards, was agony. So I was not moving around much and he observed me and prescribed Sulphur. He had seen that I wasn’t washing but hadn’t asked me why. It was because I was in total agony not because I was worse for water! His observations led him to the wrong conclusion. ROWENA: So he was assuming your skin was worse for washing? MYRIAM: Absolutely, and assuming can stop you getting to the cause. Unfortunately the Sulphur gave me the mother of all aggravations but I was really impressed. The usual story is people say they went to see a homeopath and they had this amazing cure and then they were converted. I had an aggravation and I was converted! I was so surprised that this tiny little pill could cause all of this that I wanted to start studying homeopathy immediately, but because of the aggravation I could not walk for two months! Professor Jayasuriya sent a doctor round to dress my wounds because my legs were a real mess. There was a brilliant library in the hostel, and since I was housebound, I just worked my way through all their books. In time, because I had studied more homoeopathy than anyone else there, Professor Jayasuriya asked me if I would teach and that is how I really got into it. In Sri Lanka we were part of the state South Colombo General Hospital and we had our own acupuncture ward where we saw a thousand patients a day; not in a year but in one day. We had two clinics, one in the morning and one in the evening. MYRIAM: It was amazing and total chaos at the same time. Each patient got three minutes and they all sat in rows on chairs, mostly for acupuncture. We would get some symptoms and treat them. It was a free clinic and we got to see absolutely everything. We could send patients across the hall for blood test or an x-ray and get the results straightaway. It was very efficient even though it is third world country. ROWENA: What modalities were used other than acupuncture? MYRIAM: Many different methods of complementary medicines but the first one was acupuncture. Professor Jayasuriya invented a therapy called Homeopuncture, and he used it originally on patients with vitiligo (white matches on their skin) who had not responded to other therapies. ROWENA: Was the homeopathy case-taking achieved in three minutes also? MYRIAM: On a daily basis remedies were prescribed using Herring’s three-legged stool principle but each patient was given, at some point in their treatment, a proper appointment in order to take a full case history. Sri Lankans are very laid back, they are Buddhist and generally they don’t get cancer, multiple sclerosis or AIDS. Their beliefs make them very chilled and relaxed. ROWENA: What diseases do they get? MYRIAM: Climate-related diseases such as asthma and rheumatism. Professor Jayasuriya was a rheumatologist and we learned a lot through him. They had been using homeopathy separately from acupuncture, but certain patients were still not improving and then he had the idea to take a remedy in liquid form, dip the acupuncture needle inside the remedy and then puncture the acupuncture points. When I went there in 1984 that was all they were doing. Later on we did laser therapy and after that an osteopath from England came over and taught manipulative medicine. They used all sorts of weird and wonderful therapies because Professor Jayasuriya was very inventive and creative. I asked Professor Jayasuriya why they used homeopathy and not Chinese herbs, the obvious choice, as it is part of TCM. He replied that Chinese herbs are indigenous to China and he was really against destroying the planet. He was extremely environmentally conscious and said that if you eat a mango you have to go back and plant a mango seed. With homeopathy, you don’t need to destroy a large amount of plants just for the medicine. ROWENA: Good point. So the government funded this place? MYRIAM: Yes, the hospital was government-funded, however, the University was a private establishment. In a third world country, you get so much experience and learn to make clinical decisions very quickly. At one point, I personally had a hundred patients a day with students following me around. At that time, I had no idea you could give homeopathy by mouth! I thought that the only way you administer it was by needle. When I came here I was horrified that patients took remedies orally. I was passionate about homeopathy and stayed there six and a half years. The University held four or five congresses on Complementary Medicine every year all over the world. I came back to England in 1991 and even though I was a teacher in Sri Lanka, I was never trained officially as a homeopath. I realised that I needed to go to college here because I needed to learn homeopathy philosophy; there is no time for it in Sri Lanka. There had been a war going on while I was there and we just had to get on with it full-time, seven days a week, from seven in the morning until one or two in the afternoon. It is too hot to practise in the afternoon so we had a siesta and then we would work again from five until seven and attend lectures from seven until nine. ROWENA: That is a really long day. MYRIAM: It was great though and because of the siesta, it felt like two days in one. So I came back in 1991 and realised I wanted to go a little bit deeper with this. I didn’t know any homeopaths but was told through my connections with acupuncturists that one of the best colleges, politically, was the College of Homeopathy. MYRIAM: Because my acupuncture colleagues were political people, they claimed that COH had a foot in the door of the government. Coupled with that, it was only down the road. At the same time as studying I was learning all about these machines from Germany. As I was treating patients already and I was given the option of what year to join as the college queried why I wanted to study anyway since I was already a practising homeopath. I decided to start in the second year, which is where the philosophy begins. It was a strange time in my life as I was also teaching in India and in various other places and I was already quite well known on the international lecturing circle. As a student, I was fortunate because straightaway I could apply on a Monday morning to my patients what I learned over the weekend at college and see what worked. I attended seminars by Sankaran and Vithoulkas and I met Eizayaga who was an amazing teacher. Alongside that I spent two years learning German because the Germans wouldn’t teach about their machines in English at that point. ROWENA: Could you explain to me a bit about the machines Myriam? MYRIAM: When I actually came back to the UK for good I didn’t have anything, so to make some pocket money I would help my dad in his clinic while I was learning German. I made his appointments for him and watching and observed him. In time I realised that the way he used his machine was not compatible with my style as we have different philosophies. ROWENA: So are there doctors who use these machines? MYRIAM: At that time they were only training doctors in how to use them. My dad was learning homeopathy German-style. And not only German-style but German-medical-style. Most of the remedies he used were in ampoules (an injectable form in a saline suspension that is isotonic to the body). so very little was in grains or tablets. He would transfer the information from the ampoules to the patient via injection. That is the German way of administering and it is very interesting. ROWENA: Did he work constitutionally? MYRIAM: He didn’t understand that concept at that time. ROWENA: Because he has only had a short training in homeopathy? MYRIAM: Yes, because MDs only need a short training in order to qualify to practise, but fortunately my father has an enquiring mind and was mainly self-taught. While I was there I could help him but as an allopath, he didn’t individualise. If I suggested Causticum for a stroke patient he wanted to give Causticum to all patients that had had a stroke. Consequently, I was tearing my hair out. Some doctors use the machine for de-sensitising patients with allergies against anti-biotics so you can use the machine for pretty much anything. My father was doing cutting-edge stuff just in a different direction to me. His background was in surgery. ROWENA: Is he still practising? MYRIAM: No, he is seventy-five now and helps look after my daughter while I practise. There are many different types of machine and in some ways Anton Jayasuriya is absolutely right and so are the Chinese; barefoot medicine works. Why do you need anything more elaborate? But patients in Sri Lanka are not as complicated as over here; they are not interfered with so much. They haven’t had antibiotics and chemo and radiotherapies and hormones and surgeries and vaccines. They also don’t get stressed because even while I was there during a war they were just calm and accepting and just said that it was their karma. There is a war, curfews, the rainy season and no food, but it is still their karma. Amazing. Over here there are a lot more layers and this is why I use my machine - it helps me to sift through those layers. I am still a classically trained homeopath; the shortest time I give for a first consultation is an hour and a half. But then, after taking the history, my only question is, “What needs to be cured?” and from there I work out the methodology. Homeopaths have many methodologies to choose from, for example, aetiology, Eizayaga’s layers, constitutional, miasms, acutes or Kentian. There are so many different ways and none are right and none are wrong. We tell our patients to take whatever it is that we give them and we might give them another remedy as a backup if the first doesn’t work. We ask them to let us know in six weeks how they have done and then we reassess. If both don’t work then perhaps there is something that is blocking the case like use of steroids currently or in the past. ROWENA: So if someone is on steroids, would you give them Cortisone to clear the layer? MYRIAM: Yes, or perhaps Apis. Checking out the regular remedies with my machine, I would be able to see that they didn’t work because the cortisone was creating a block. Cannabis also blocks remedies from working. ROWENA: So do you give Cannabis in the same way, to clear that block? MYRIAM: Sometimes I just give it and wait. I find the remedies don’t work otherwise. ROWENA: In what potency would you give Cortisone or Cannabis under those circumstances? MYRIAM: Sixes or thirties, it depends on what effect it has had on them. Sometimes it will be as my first prescription but my style is always changing and developing. When there is a lot of allopathic interference, you have to decide how to treat them and on what level and there is still no guarantee that the remedies will work. An allopathic drug may have blocked the remedies’ action for whatever reason. Today, homeopathy is more challenging then in Hahnemann’s times. There is a lot more pathology, especially in modern cities like London. In Iceland, India and Sri Lanka there are more clear-cut constitutions but that is not the case here and this creates a problem. ROWENA: So let us say somebody comes to you with cancer. How do you approach their case? MYRIAM: I would take the history with a timeline because we need to understand where, how and why the ‘dis-ease’ originated. In cancer cases or cases with mixed pathology, I see the case in layers as this approach breaks the case down into bite-sized chunks. I would use my machine as a tool because it is important for me to know which organs are affected and how much pathology there is. ROWENA: How does the machine tell you that? MYRIAM: The type of machine I use is meridian-based technology. There are many channels of energy or meridians, which travel all over the body and these channels end in the fingertips and in the toes. A circuit is created when the patient holds a brass electrode connected to the machine, which has a dial from which you can get readings. What is being measured is the electrical resistance of the acupuncture points and when there is a disorder the resistance reduces. Each machine is calibrated so that the readings are from zero to one hundred. A reading of fifty is fine but with a child it may be sixty as their vitality is stronger. We can actually measure the vital force of a patient using the machine. Measuring each of these points on the hands and the feet takes less than five minutes and then I will make a note on their card of the state of their organs. If the reading is only thirty-five or forty for the large intestine, I will underline it. If it is really low I will underline it twice and circle it; just like when we use the repertory and we see remedies in plain, italic and bold. The readings provide useful information for me. Using a patient with cancer as an example, although his case has serious pathology, this still could be a Kentian aetiology as there is a strong emotional component that could have triggered his illness. His wife had thrown him out, they got divorced, he has restricted access to his children and he has to now pay for two mortgages and sort his health out alone. He is angry about the injustice, is feeling like a victim and it is likely I would think about giving him Staphysagria or Carcinosin as a top layer. Then from the readings if his liver or kidneys are really low then I would give him remedies to support, detox and drain those organs. These remedies I supply in a separate bottle and they are usually a combination of herbal tinctures. For homeopaths there are many different ways to treat a patient. Everything you do is based on your perception, knowledge and observation at that point in time. The machine gives you an objective tool to assess the state of the organs and this may influence your prescribing but it doesn’t mean that you don’t use your normal methods as well. With a tool like this we can see how much pathology there is and how much change has occurred when they come back for a follow-up sessions. A patient could come for treatment for headaches but with the machine as a tool you can assess clearly where the condition is originating from and see if something more sinister is going on. ROWENA: Which is an area we could be weak in if we didn’t pick up the red flags. If your patient had had chemotherapy, for example, would there be a specific remedy that you would prescribe first? MYRIAM: Cadmium sulphuratum deals with the side effects of chemotherapy beautifully so I would give an individualised drainage tonic with specific herbal tinctures and tissue salts so that the patient can take it frequently to give organ support and I would include the Cadmium sulph. MYRIAM: Yes, a 6C. The tonic drains the liver, kidneys and lymph and the Cadmium sulph is for toxicity but it might not work for all patients. It is also good for assisting patients to stop smoking. Once we have worked out what needs to be cured and what sort of remedy we are going to prescribe, then we can check the remedies on the machine. What I have explained to you so far is the diagnostics aspect. My particular machine also provides an electro-magnetic treatment. Patients hold the brass electrodes and place their feet on brass footplates. This creates a closed cybernetic circuit within them, and uses their energy and modifies it. It works by taking harmonic, healthy waves, and amplifying them to make them stronger. At the same time the disharmonic, unhealthy waves are inverted in order to cancel out their pathology. MYRIAM: Yes. It is like making a nosode in a way. The machine separates out what is healthy and what is not healthy and there are two different waveforms. Diseases don’t just happen; they start off with bio-physical changes and then they turn into chemical changes and then into pathology. Often, when people come to us, we get the end stage of their rheumatoid arthritis or Crohn’s but it has taken time to develop. The machine has a honeycomb testing plate named as such because it has little holes where you can put remedies. Anything you put on this testing plate will go into the circuit and then you can see what influence a particular substance or remedy has on the patient. With the remedy on the testing plate you can then recheck their points. You might think that your patient needs Calcarea carbonicum in low potency repeated often so you might place a 6C on the testing plate and check their weak points, which you already ascertained at the beginning of the consultation. You then look to see if the remedy has pushed the readings up and if it has then it is a good remedy for them. If it brings the readings up and then the needle goes down again it means it is good but it is not going to hold. I then will try a 12C and 6C together and I keep doing this until I have two or even three potencies of one remedy all together and the reading holds. I give all my patients remedies in water as I find that medium much softer. ROWENA: So do they bang it on their hand like LMs? MYRIAM: If the remedies are in very low potency, yes. ROWENA: So they would be plussing it. MYRIAM: Yes. Hahnemann said you should never repeat the same remedy twice. Diseases are dynamic, so their cure should be too. I feel that homeopathy can work very much preventatively and if you see a constitution we can predict what might happen next. We might recognise what acute remedy a patient might need by using the relationship of remedies. For example, a patient who resonates with one of the Mercuries constitutionally will need Pulsatilla in an acute. They might also go into a Rhus toxicodendron acute and get stressed out and have joint pains or they might also need Syphilinum because that is their genetic, miasmatic remedy. They will also need a tonic because that group of remedies reflects a very toxic state. As a result my patients go away with three or four spray-top bottles of remedies. ROWENA: The main criticism of poly-pharmacy, which I am sure you are aware is…. MYRIAM: How do you know which remedy has done what? ROWENA: So how do you know? MYRIAM: I don’t regard my prescribing style as poly-pharmacy. ROWENA: So what is the technical term for when you prescribe lots of different remedies at the same time? MYRIAM: It is the same remedy but in different potencies at the same time and that will be their main remedy. The tonics are on an herbal level to support the organs. Here is a typical example of how I prescribe. Let us say that the patient is tubercular and has come to see me with recurrent coughs and colds. Having taken their case I might find that genetically or constitutionally they are one of the tubercular remedies like Tuberculinum, Calcarea phosphorica or Phosphorus but because of the nature of tubercular types and their sensitivity, they can’t take their constitutional too often. On a tonic level they will need remedies to support their lungs. For some patients, when the lungs are affected, so is the skin and bowels. In Chinese medicine these organs are related. Nothing deep goes into the tonics; perhaps I will use Lobelia. For a lot of people I use Iodum for coughs, which is effective and mild, and with the tubercular types it covers a lot of thyroid issues. I might use Berberis if they have eczema as a result of their lungs being messed up. And then of course I look at diet and life style. ROWENA: And you put your remedies on your machine which checks out all its ingredients and how the patient will respond to it. MYRIAM: Yes, I call it cooking or alchemy. Do they need more of this? Do they need more of that? It cooks until it is beautifully tailored to the patient. ROWENA: It is really great talking to you Myriam. Your description of how you prescribe, I hope, will answer a lot of the questions from homeopaths and patients who didn’t understand it before, as this is not the way some of us were trained. MYRIAM: Homeopathy is a very old system of medicine. They say the Egyptians used it as well as Paracelsus and then Hahnemann came along and created a system; after all he is German and they are very good at that! He did all the groundwork for us and developed the principles and worked out the provings and potencies. And he changed his mind many times as he refined it and carried on evolving through his many editions of the Organon. In the last edition, for example, he went on to create the LM potency because he found through trial and error that LMs were the most gentle of all potencies. He was always looking to make things as refined and precise as possible. If he were alive today he would have developed homeopathy even further. ROWENA: So tell me where you teach Myriam? 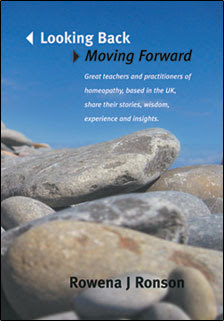 MYRIAM: I teach homeopathy in various colleges, The Practical Colleges in the Midlands and in Iceland and the Lakeland. Also the Shamanic School of Homeopathy and the London College of Traditional Acupuncture. I think that one of those absolute keys to being a successful homeopath is having a curiosity for knowledge. Once you think you know it, you haven’t got it all.